The drip-drip analysis of the results of Census 2011 – taken on the night of Sunday, 10th April 2011 – continues with the Central Statistics Office (CSO) this morning releasing further information on our housing. Some of the information has emerged previously, but there is both additional detail published this morning as well as totally new information. The CSO’s press release is here and the report itself is here. Possibly the most striking change in Irish residential property between the previous census in 2006 and Census 2011 was the surge in households renting their accommodation rather than purchasing it. Whilst the overall population of the State grew by 8% between 2006 and 2011, the number of households paying rent to private landlords grew by a staggering 120% from 145,317 to 320,319 – overall renting households increased by 47% from 323,007 to 474,788 but the increase in local authority/housing association renting was much less than the increase in private landlord renting. Research into reasons behind this phenomenon would be interesting, but a mortgage credit drought, declining house prices, rocketing unemployment and an economy which shrank by 10% will all have played a part. What is just as fascinating on here is the assumption on the part of some that the renting phenomenon evidenced in 2006-2011 was temporary and will be reversed as soon as economic conditions stabilise. There seems to be an assumption that there is some ingrained social need in Ireland to own property. But there was once also a need to be guided by the Church, to be deferential to banks and politicians and to generally acquiesce with the groupthink emanating from Dublin 2/4. Whilst the spurt in the number of households renting might indeed reverse when the economy stabilises, the trend might also continue with a generation still warned off owning property by the experience of the last decade. The CSO’s indices are Ireland’s premier indices for mortgage-based residential property transactions. The CSO analyses mortgage transactions at nine financial institutions : Ulster Bank, Allied Irish Banks, Bank of Ireland, ICS Building Society (part of the Bank of Ireland group), the Educational Building Society, Permanent TSB, Belgian-owned KBC, Danish-owned National Irish Bank and Irish Nationwide Building Society. The indices are hedonic in the sense it firstly groups transactions on a like-for-like basis (location, property type, floor area, number of bedrooms, new or old and first-time buyer or not) and then assigns weightings to each group dependent on their value to the total value of all transactions. The indices are averages of three-month rolling transactions. Cash transactions: Unfortunately, this month the CSO has not published information on the overall size of the residential property market, nor the cash/mortgage split. It is hoped that it will be available in September 2012. It is understood that the CSO has started to receive data from the Revenue Commissioners which shows all individual residential property transactions, but the data is still being validated and tested. Why is this information so important? Because at present, the CSO analyses mortgage-based transactions only, and cash-based transactions may be of a different nature, with the perception being that they will value property at a lower level than mortgage-based transactions. Personally I am skeptical because if, as some commentators suggest, residential property prices are in fact down 60% nationally from peak, then this would indicate the cash-based component has fallen by dramatically more than the mortgage-based component. In fact if cash comprises 50% of the market, and the average decline is 60% and the mortgage-based component is down just 50%, this indicates the cash-based component is down a staggering 70% which seems unlikely – what mortgage company valuer will value a property at 50% from peak, if he knows that there are significant numbers of cash transactions at 70% from peak? Separately we are now expecting the Property Regulatory Services Authority will introduce the new House Price Database in September 2012. In Northern Ireland, last week they introduced a residential property price index based on all transactions. I don’t think the CSO would be happy with this approach but it seems to me that the PTSB/ESRI series, as represented by its historical indices, closely correlates with the performance of the CSO indices. What’s surprising about the latest release? Prices nationally have risen for the second time since September 2007 – yes there have been a few flat months, but this is the second month after May 2012, since the boom that prices have actually increased, albeit by just 0.2% in one month. The increase however was outside Dublin – Dublin houses fell by 0.3% in the month and Dublin apartments fell by a staggering 3.9% in the month. Are prices still falling? No, prices are up 0.2% nationally after a decline of 1.1% in June, the blip increase of 0.2% in May following a decline of 1.1% in April 2012, it was flat in March 2012 which followed a 2.2% decline in February 2012, 1.9% monthly decline in January 2012, 1.7% decline in December 2011, 1.5% decline in November 2011, 2.2% decline in October 2011, 1.5% decline in September 2011 and 1.6% decline in August 2011. How far off the peak are we? Nationally 50.3% (52.6% in real terms as we have had inflation of 4.9% between February 2007 and July 2012). Interestingly, as revealed here, Northern Ireland is some 53% from peak in nominal terms and 59.5% off peak in real terms. Are forbearance measures by mortgage lenders, a draconian bankruptcy regime and NAMA’s (in)actions distorting the market? Or are cash transactions which are not captured by the CSO index so significant today that if they were captured, the decline in the Republic would be even greater? How much further will prices drop? Indeed, will prices continue to drop at all? Who knows, I would say the general consensus is that prices will continue to drop. This is what I believe to be a comprehensive list of forecasts and projections for Irish residential property [house price projections in Ireland are contentious for obvious reasons and the following is understood to be a comprehensive list of projections but please drop me a line if you think there are any omissions]. What does this morning’s news mean for NAMA? The CSO index is used to calculate the NWL Index shown at the top of this page which aims to provide a composite reflection of price movements in NAMA’s key markets since 30th November 2009, the NAMA valuation date. 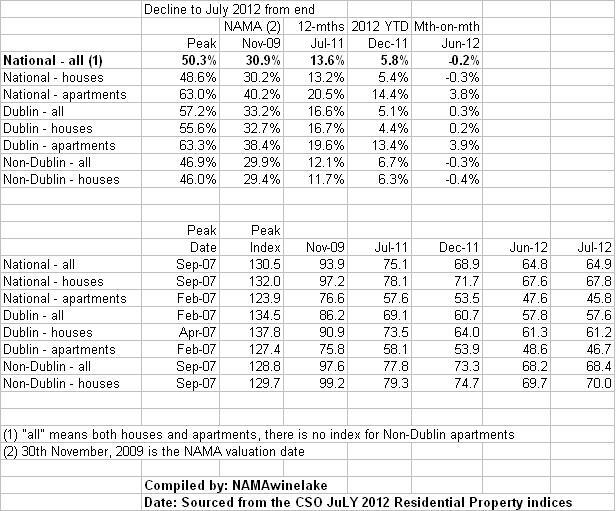 Residential prices in Ireland are now down 30.9% from November, 2009. The latest results from the CSO bring the index to 803 (24.5%) meaning that NAMA will need see a blended average increase of 24.5% in its various property markets to break even at a gross profit level. The CSO index is a monthly residential property price index calculated from mortgage-based transactions. Ireland does not yet have a publicly available register of actual sale prices, but one is finally expected at the end of September 2012 – read the latest on the House Price Register here. There are four other residential price surveys, based on advertised asking prices or agent valuations (see below, details here). In addition Phil Hogan’s Department of the Environment, Community and Local Government produces an index based on mortgage transactions, six months after the period end to which the transactions relate, and which is not hedonically analysed – it is next to useless. 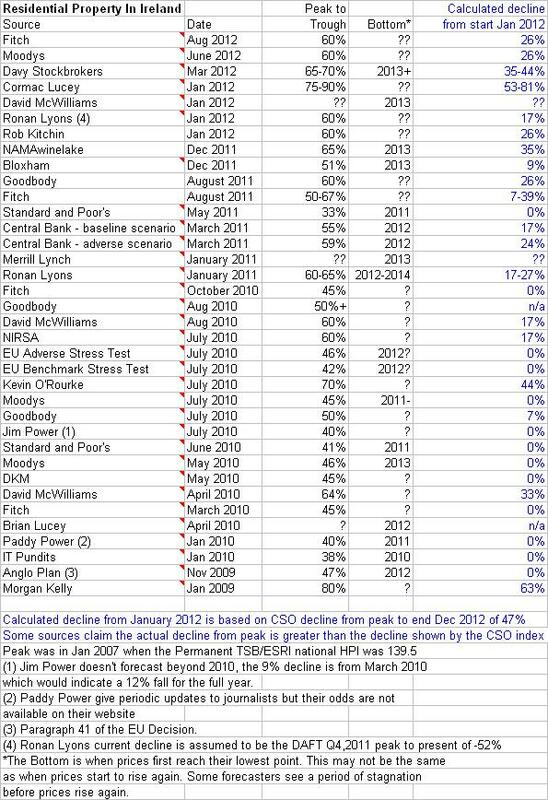 What did the bailout Troika ever do for Ireland? They’ve already given us the Fiscal Advisory Council which independently pronounces on whether or not the Government’s plans will help meet our budget targets. You can wave goodbye to the days of Charlie McCreevy and the “if we have it, we’ll spend it” approach. You can largely wave goodbye to cynical giveaway budgets on the eve of elections. The Fiscal Council might have gotten off to a rocky start in 2011 when the Government ignored the recommendation for a bigger budget adjustment, but with the legislative backing of the Fiscal Responsibility Act, you can expect the Council to come into its own in the run-up to Budget 2013. Next month, we’ll have the House Price Database of all residential property prices from the start of 2010 – that’s the Database that has been called for, ever since the Kenny Report in 1973. The idea of a Database proposed by Judge Kenny in 1973 was universally supported by Fianna Fail, Fine Gael and Labour but somehow, in forty years whenever they were in office, they failed to introduce it until Ajay and the boys and girls from the Troika came onto the scene. By the end of this year, we should have a reformed personal insolvency regime which tries to bring Ireland into the 20th century, and who knows, if we have honest and effective debates in the Oireachtas, we might even get a regime fit for purpose for the 21st century. Thanks to Klaus and Craig and the other good people in the Troika, we’ll no longer have draconian 12 year bankruptcy periods but something which tries to balance the needs of borrower and lender. And in 2013, Ireland will have a central credit registry which will keep track of all your loans, and how well you’re repaying them. It might sound Big Brotherish but it is part and parcel of modern developed economies. It should make getting credit easier for deserving borrowers with a good credit history, and it should stop (mostly our) banks making bad loan decisions. You can wave goodbye to loans being given the nod, just because of cosy rounds of golf with the bank official, it will come down to the brass tacks of what you owe and how well you deal with your debt. And you can thank Istvan and his associates for pushing us to it. The Bill to create the credit registry will be published in September 2012, but yesterday the Government gave us basic details. The registry will be operated by the Central Bank of Ireland, and will try to capture all commercial and personal credit transactions, so that prospective new lenders can check to see if you – whether “you” are a business or a consumer – can afford a new loan. There is no facility for Joe Public to check other people’s credit standing, but there will presumably be a facility for Joe Public to verify the accuracy of their own standing. NAMA will be one of the lenders whose information on borrowers will be collated by the CBI, and indeed lending by local authorities will also be captured. The bulk of the information is likely to come from the banks and credit unions. And lastly, in defence of the Troika which is likely to receive a lot of political flak in the next four months in the run-up to Budget 2013. Remember we have a colossal gap between what we generate in tax and what we spend on welfare and public services. That gap is not the fault or creation of the Troika, but closing the gap is what the country needs and what the Troika is overseeing. As the Memorandum of Understanding makes clear, the Irish government still has sovereignty and can change proposals in the Memorandum as long as the budget gap is closed. So whether it’s property tax, water charges, PRSI, medical cards or whatever else comes on the agenda in the next four months, our government can make adjustments and substitute different measures as long as they generate the same financial result.